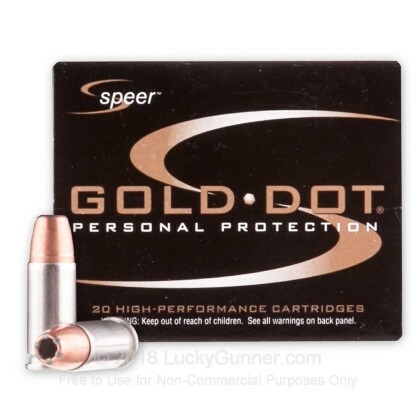 Speer's premium 25 ACP Gold Dot line of JHP defense ammunition is designed for personal protection. 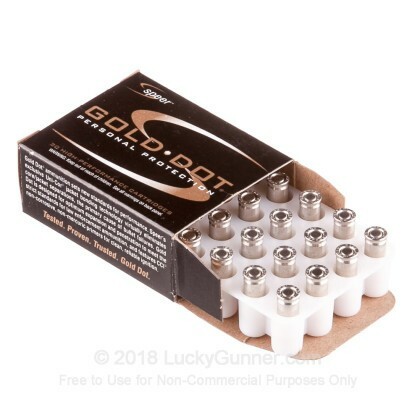 Speer Gold Dot Ammunition is loaded with bonded core bullets and designed for critical defense needs. Bonding the jacket to the core means the elimination of core-jacket separation and superior weight retention making it more effective than traditional hollow-point bullets in the event that the bullet encounters bone or heavy clothing upon entry. 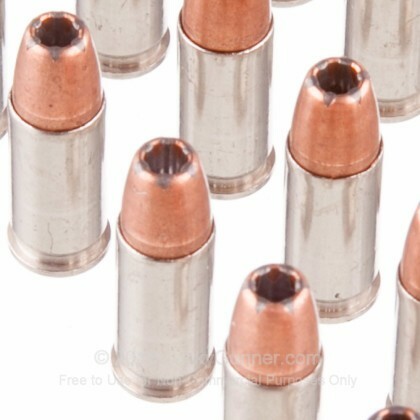 This ammunition is new production, non-corrosive, in boxer primed, reloadable nickel-plated brass cases. Expensive, and in the lower tier of accuracy & performance. 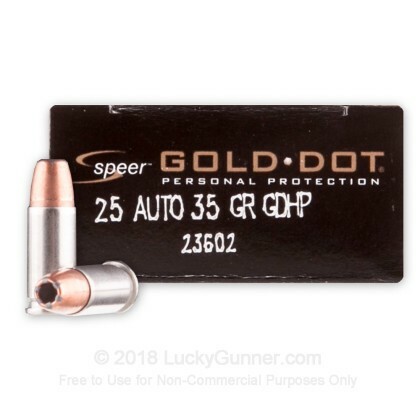 Speer Gold Dot is reliable, fairly clean burning ammo, but it routinely shoots the largest groups, and costs the most out of other ammo in its class. Quality is very good, accuracy is adequate, expansion is good/average, cost is above average, reliability is very good, but it is far from the best on can get. Ammo like Sellier, & Privi (PPU) are starting to eclipse brands like CCI for less money. Guns fired from: Beretta 21A, Beretta 950, Browning Baby Browning, Galesi, Colt 1903 Vest Pocket Hammerless, Jennings Raven, FN Vest Pocket, Taurus pocket pistol, Phoenix Arms, Seecamp, Bauer, and a few Italian & Spanish mystery pistols. 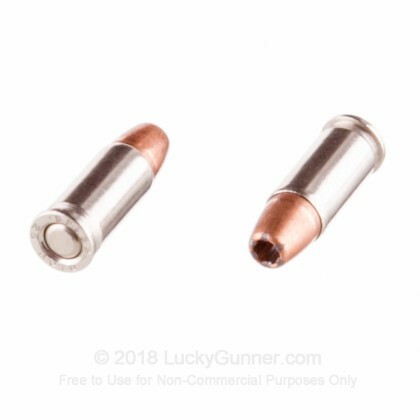 Seems anything in 25 cal is hard to come by these days but, not only did LG have the caliber, they had Speer Gold Dot JHP. I am an NRA instructor, I as many realize some places I visit presents a need for a backup Gun. My 25 is great for that as it is the most concealable Gun I have. Knowing I have Gold Dots in it gives me a warm fuzzy feeling, I trust Speer with my life every day as do many police and military representatives. I'm glad LG came through for me! This may be the best deal in .380 there is. In Europe, .380 is a common police load, and this is perhaps the best of those available. Also great dealing with Lucky Gunner, as usual. 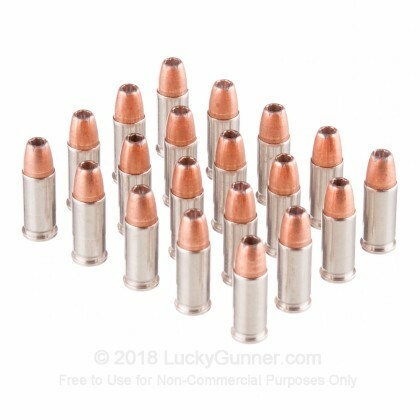 Use for CCW load. Shot an old metal chair from 25 feet, and penetrated the 10ga metal.